Many of us wonder if a person can actually grow more after the regular growth years, the teens. Well I've got some information here that shows NBA players who grew late. 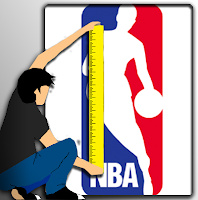 Yes, there were NBA players who had experience having late growth spurts, and they grew not just a bit, some of them even grew for about almost a foot. NBA players and their late growth spurts. Dennis Rodman - He was 5'6 in high school. Then at the age of 19, he went from 5'9 to 6'8. David Robinson - 5'9 his junior year of high school and 6'7 his senior year and then 7'0 in College. Scottie Pippen - Entered college at 6'1. Final height? 6'8. Michael Jordan - He grew from 5'10 to 6'3 from his sophmore to junior year in highschool. Final Height is 6'6. I also heard no one in his family is over 6'0, but that was from only one source so not sure. Chris Anstey - Played tennis until age 17. Then started playing basketball and grew 7 inches. Final height was 7'0. Hmmm did he grow taller because of basketball? Tim Duncan - Grew 8 inches in some of his highschool years and now maxes out at 6'11. Lamar Odom- Was 6'2 as a highschool point guard. Out of nowhere he hit a huge growth spurt to 6'9. Manu Ginobli- Hes from Argentina, a country whose average height is 5'8 1/2. Both of his brothers were late bloomers, and reached 6 ft in their teens. Manu was also a late bloomer and in two years, he shot up 10 inches from 5'8 to 6'6. This shows that people who are already in their 20's can actually grow more. Some say that they grew more due to being athletic. When you are a basketball player, your body is engaged into athletics such as running and jumping, these activities are said to be factors for growth. Another thing for this is that basketball players often do stretching, which also contributes to growth. can the same thing happen to girls? :$$ i mean .. I'm 18 and I'm only 5.1 ft tall :( can I at least take 1 or 2 inches with gym or something? i am 6'4 at the age of 17 and i wish to hit the 6'8 at least!! !